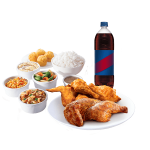 Half Classic Roasted Chicken and 4 pieces of OMG Unfried Fried Chicken with 4 Regular Side Dishes, 4 Muffins, 4 Rice and 1 Pitcher of Iced Tea or Soda. Same day delivery to Manila, Cut off time is 2pm local time. Order received after 2pm will be delivered on the next day. Our shipping charge is $4.99 nationwide. Food Item can deliver only within Metro Manila. However we can deliver food item to nearby provinces if order over $169. Please read our complete delivery policy in information section.